Abstract: The AOpen COM5252 is capable of burning CD-R media at 52x speeds and CD-RW media at 32x. Reading CD-ROM material hums along at 52x. The CD burner has quietly revolutionized the way people move and store data. While most PC's still come with 3-1/2" floppy drives, they're a relic of the past. Most people seem to agree that it's about time we did away with floppy drives altogether given their paltry, 1.44MB storage capacity! CD writers themselves have stayed pretty much the same since they were first released en masse in the late 90's. Sure they've gotten a whole lot faster and now many come with buffer underrun protection, but in essence they do the same thing. Optical media too, has pretty much stayed predominantly the same; CD-R/RW discs still come in 74/80 minute lengths, or 650/700MB flavors. While there are a few higher capacity CD's on the market, they've never really taken off for a variety of availability and compatibility reasons. 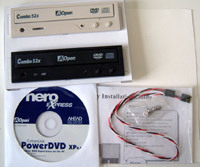 In any event, in this review, PCstats.com is testing the new AOpen COM5232 CD-RW/DVD combo drive. 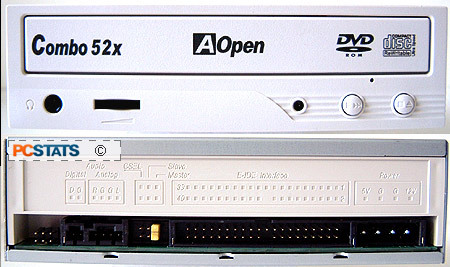 The AOpen COM5252 is capable of burning CD-R media at 52x speeds and CD-RW media at 32x. Reading CD-ROM material hums along at 52x, and the drive can also read DVD's at 16x. Combo drives are generally great for those who need the storage capacity of a CD burner and the ability to read DVD's at the same time. As a bonus, the Aopen com5232 also comes with removeable face plates so you can mix with your case. The AOpen 5232 combo drive is rather plain looking, but I like it because it's not gimmicky (no flashing lights!). For those of you with a nice old beige or black case, AOpen include three face plates with combo drive. The first is shown above, snow white in colour, the next is beige, which gre at for old PC's and there is also one that is jet black. Measuring in at 19cm long, the Aopen com5232 drive is standard size, so take care when installing the writer into a SFF PC. The rear of the COM5232 drive looks like any other normal optical device, on the very left is a six pin header of unknown function, next is the two pin digital output, the four pin analog output, Master/Slave/Cable Select header, IDE port and finally the molex power connector. The AOpen 5232 combo is compatible with all the regular writing methods, Packet writing, TAO (Track at Once), DAO (Disc at Once), SAO (Session at Once), Multisession, Variable Packet Writing and Fixed packet writing methods. All modern drives can be mounted vertically or horizontally, and the AOpen 5232 Combo achieves this by mounting clips inside the tray of the drive. Users will be happy to hear that the drive is virtually silent even when reading data CD's! That's definitely welcome news to anyone who's used a loud CD-ROM, and knows how annoying they can be.